Our Anti-Aging Regenerating Serum is nourishing, firming, brightening, and helps smooth out even the most stubborn of wrinkles. We recommend using our serum in combination with our night crème to intensify anti-aging results. However, if you have oily skin that is more prone to breakouts, then we recommend using the serum alone instead of the night crème for a lighter application. This formulation utilizes a unique combination of pharma-grade actives that are assembled and encapsulated as sub-micron spheres in an extra-mild base for most effective delivery and prolonged release in the skin. Fast absorbing formula provides instant and long-lasting skin nourishment. Firms your skin, combats wrinkles, dull skin and free radical-induced damage. Rejuvenates your skin to its former brightness and suppleness. Apply liberally onto the skin before bedtime. Spread evenly and gently massage into your skin. Could be using in combination with our Night Crème or alone. Stop irritation if irritation or rash develops. Keep out of reach of children. Squalane: (olive oil-derived wonderful for all skin types—even the most sensitive! Nature’s greatest moisturizer) Softens, diminishes tiny facial lines. Heals, soothes dry, irritated skin. Creates a barrier to protect your skin against the harsh environment. As a base it makes your moisturizer and facial treatment work more effectively. Squalane is 100% compatible with the natural oils of your body. Dipalmitoyl Hydroxyproline: (Lipo-aminoacid, anti-aging, firming, moisturizing) Long-lasting firming & moisturizing effects, powerful anti-wrinkle action by stimulating contraction of collagen fibers, inhibition of age promoting enzymes, inhibition of free radicals, maintains integrity of the skin barrier, penetrates deeply into skin. Ceramide III: has been used as a highly functional cosmetic ingredient for maintaining skin moisture balance by repairing damaged skin lipid barrier. Sodium Ascorbyl Phosphate: (Vitamin C source, anti-oxidant), the forms of vitamin C that are proven most stable and effective are: ascorbic acid, L-ascorbic acid, ascorbyl palmitate, sodium ascorbyl phosphate, retinyl ascorbate, tetrahexyldecyl ascorbate, and magnesium ascorbyl phosphate. Regardless of marketing hype – there is no one “best” form of topically-applied vitamin C. All antioxidants, including vitamin C, are vulnerable to deterioration in the presence of air and light. If a product containing antioxidants does not come in airtight, opaque packaging, don’t buy it! Tocopheryl Acetate, or more commonly known as Vitamin E, (source of antioxidant) a natural preservative, anti-oxidant and moisturizer. It reduces trans-dermal water loss and helps maintain connective tissue. 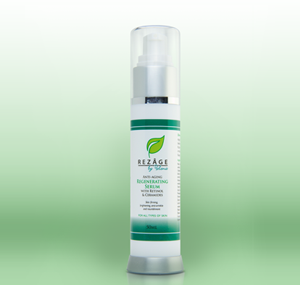 It is effective as a natural defense against harmful UV rays, preventing hyper-pigmentation and sun damage. Vitamin E is used in all kinds of cosmetic products and is taken as vitamin supplements for skin care, hair care and cell generation.